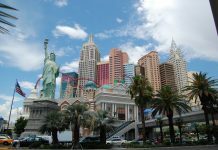 If you missed the first installment of our Vegas Road Trip, catch up with our first post here. Now that we were officially driving down the western coast, we really felt like we were on our way to Vegas. Our drive down to Portland was uneventful as it was a short and quick trip! On arriving in Portland, however, the problems did begin. We noticed that the car was leaking quite a bit of liquid from the bottom so we asked where the nearest garage was to take the car and off we went. We explained the problem and the mechanic asked if we had air conditioning. My brother said no, the car didn’t have it. The mechanic went on to explain that it’s fairly common that people don’t realize they have A/C, and condensation can appear on the bottom of the car while it’s being used, which can drip off and make it look like a leak. My brother assured the mechanic that he’s owned the car for years and he was 100% sure that it didn’t have air conditioning. After sitting and impatiently waiting while hundreds of bad thoughts went through our heads (what if the car couldn’t be fixed and we were stranded in Portland? What if the repairs were going to cost a fortune? What if the repairs would take a while and it threw off our entire trip? ), the mechanic came back with a grin on his face. I guess you learn something new every day! That’s a moment that we still laugh about to this day, and it was also a life-saving moment because of the drive that we had ahead of ourselves (more on that later). We spent two nights in Portland because none of us had been there before. 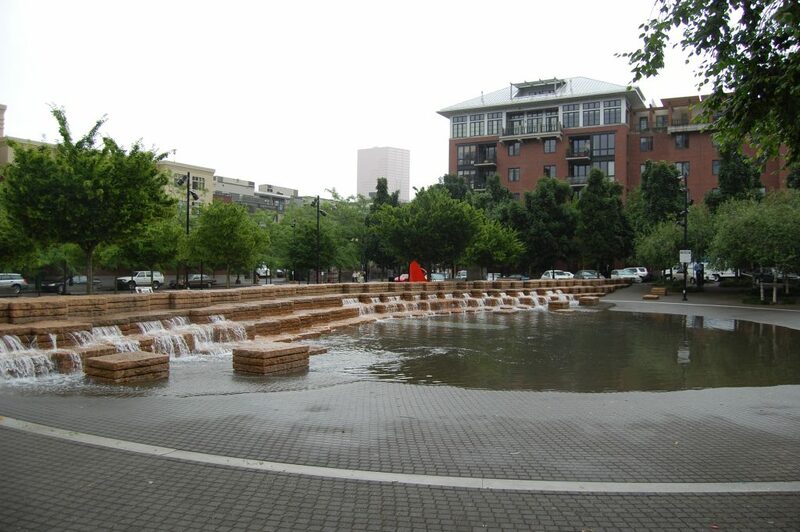 Our first impression was that it was a nice, quiet, and green city. We walked around a lot of it, finding green spaces with wildlife intermingled with the streets. Many people have heard of, or watched, the show Man Vs. Food. 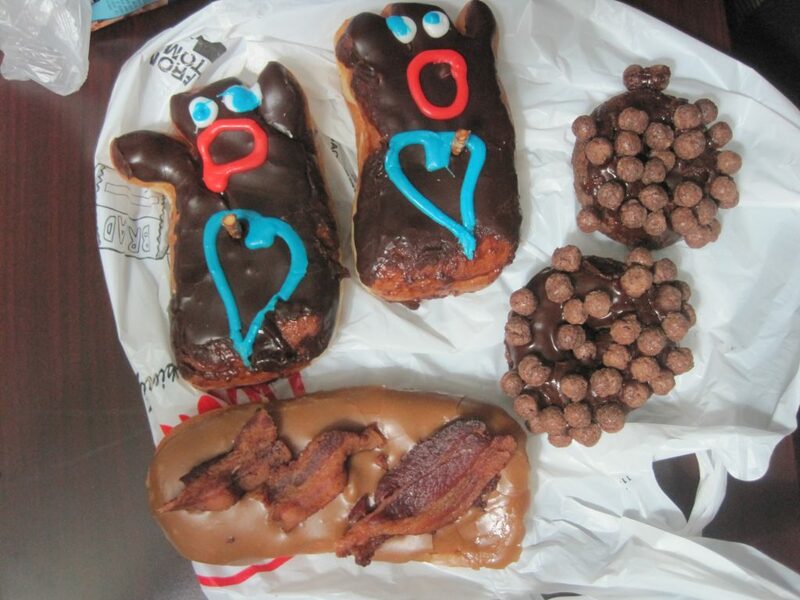 We used to watch it all the time and discovered a place called Voodoo Donuts from it, which is based in Portland. This alone is easily a worthy reason to visit the city. We went at 10pm and the line-up was still out the door! Mmmmmm. Yes, that one was maple bacon. And yes, it was delicious. We enjoyed our time here but don’t think that we did Portland justice. We’ve read a lot about how it’s a hub that attracts people for it’s artsy and musical culture, but we didn’t seem to find that. Clearly we weren’t looking in the right spots, so we’d like to visit again one day to see what we missed. Our next big destination was too far away for a day’s drive, so we needed to stop in between. But where? That was the big question while we were planning the trip. We had never heard of it, but we liked the name and it was a good stopping distance between destinations. To be honest, it doesn’t have much going on. 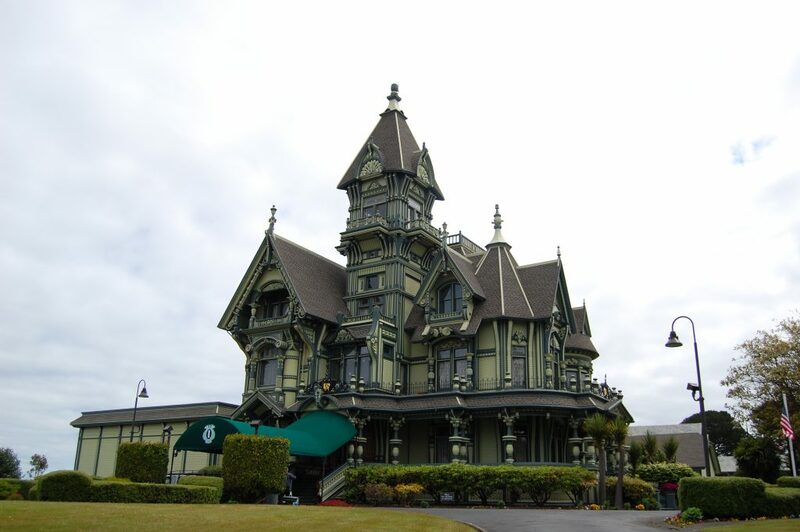 They have a few quirky buildings that we quite enjoyed looking at but, besides those, we didn’t have a very eventful night. We thought it was very Disney-esque! 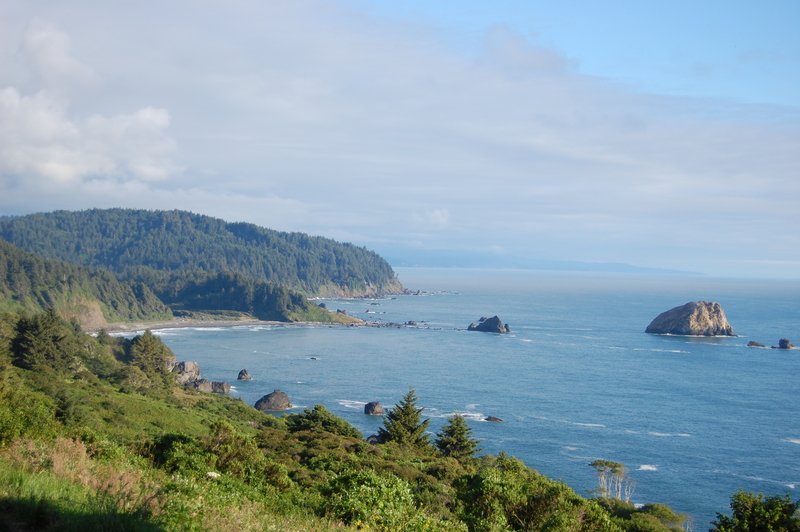 But I’m getting ahead of myself now because I need to mention the drive to Eureka. To this day it’s still my favorite road that I’ve driven on! It twists and turns through the Redwood Forest, with gigantic redwood trees stretching high into the sky. Remember the game Cruisin’ USA on the Nintendo 64? 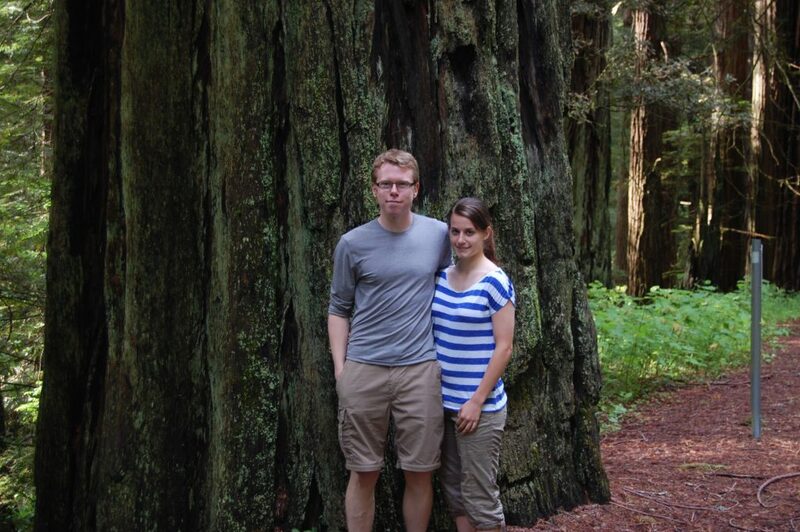 The Redwood Forest was the hardest level to beat, and I was playing the real life version of that. Amazing. There were loads of epic viewpoints to stop off at, and we kept having to pull over just to admire the trees themselves. They were huge. Words don’t do them justice. Now that’s a big tree. We took a slight detour to drive through a tree. Yes, you read that right. The trees are so big (am I stressing this enough?) that they’ve hollowed one out and you can literally drive your car through it. And my brother’s car wasn’t exactly small. It was a tight squeeze, but through we went. Then we did a Chinese fire drill (all changed seats), looped the car around, and drove through it again. And again. 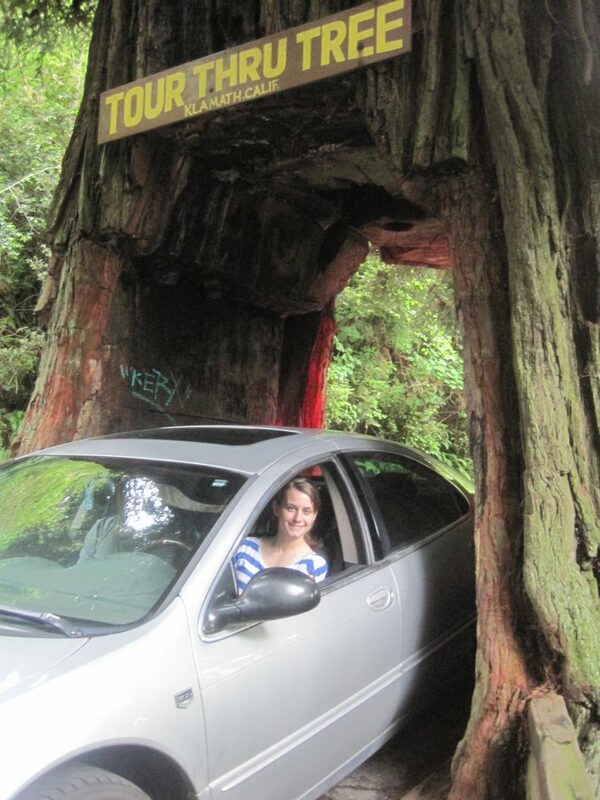 It’s not every day that you get to drive through a tree, so we each needed a turn! The beautiful journey continued south down the coast of the US. We were right on the coastline now after staying in Eureka for the night and we reached San Francisco with no problem. But this wasn’t the road trip for things going wrong while on the road. This was the road trip for things going wrong once we reached our destination. Now I’ve driven in quite a few different countries, but it’s still safe to say that driving in San Francisco is still the most frustrating to date. There was lane after lane after lane on the main roads: car lanes, bus lanes, tram lanes and bike lanes. Each lane was labelled and dotted lines covered the roads, which took a lot of concentration to decipher them all while you’re trying to keep an eye on all sorts of vehicles surrounding you. We got caught up driving around the exact same block literally four times, and this wasn’t a small block either. The car lane was the middle-most lane, so we had to cross all the others to turn right. We just didn’t understand how to do this safely. The first time we slightly panicked and were confused by everything, but thought we would get it the second time around. On the second time around, we still didn’t notice how we were supposed to turn across all these lanes so missed it again. The third times a charm right? Wrong. We were just as bewildered as every other time, and were starting to get annoyed now. How freaking hard can it be to turn right?! Finally, on the fourth time, we just veered across all of the other lanes and turned. Did we do something illegal by doing that? We still don’t know. But we finally managed to turn right and nobody was harmed in the process. We finally reached our hotel, which we purposely chose because it was quite nice looking and also affordable due to it sitting just outside the central downtown area. My brother jumped out to check-in, leaving James and I to park the car. The hotel was charging a small fortune per night to park there, and we were staying for three nights so that was out of the question. We drove around with our eyes peeled, and finally saw a sign that was advertising a much cheaper price for the privilege of parking our car. We pulled into the chain-link fenced off area and spoke to the guy in charge. We agreed on a price and negotiated that we would be able to park our car inside of the garage, rather than outside where it was only protected from the fence. Once things were settled we turned towards the door to leave. “You need to leave your keys,” we heard from behind us. We shot each other extremely worried and unsettled looks, quickly deciding what to do with the keys to my little brother’s car, our lifeline on this trip, which he had just left in our trusting hands. We nicely told the guy no thank you, we would prefer to keep the keys on us. After a bit of debating he asked us to move the car to a new space, and then we could keep the keys with us. We moved it and quickly walked back to our hotel, clutching the keys in our hands and wondering where in the world we’d just left the car?! Will it be there in the morning? Was that the stupidest thing that we’ve ever done? James and I exchanged awkward glances and admitted to my brother that that area was, in fact, exactly where we left his car. We were a little unsettled for the evening, slept on our uneasy minds, and first thing in the morning we went to check on the car. All was fine and it was still there and intact. We were all more confident now and enjoyed touring around San Francisco, and we had absolutely no problems whatsoever with where we parked our car. Phew. Besides these couple of incidents, we thoroughly enjoyed San Francisco. 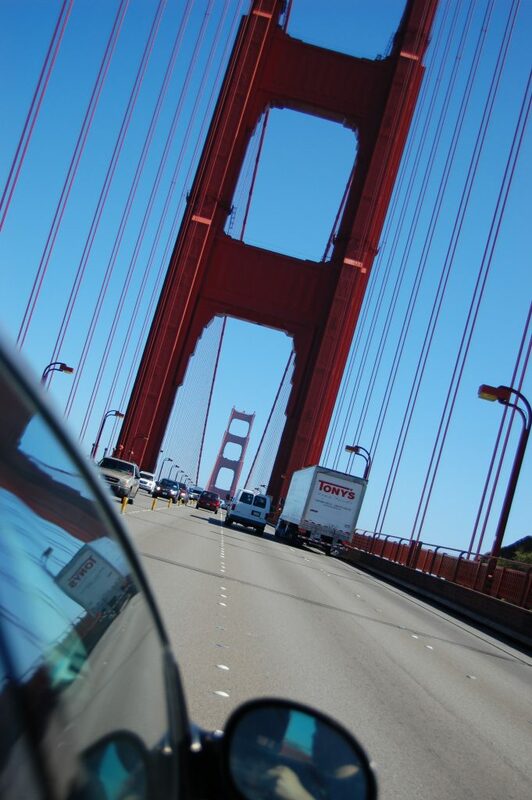 The most exciting part of the drive from this leg of the journey was getting to drive across the Golden Gate Bridge! Not the typical view of the bridge! Did we miss seeing anything in Portland? Have you accidentally found yourself in a not-so-nice area of a city before? Let us know below! Natural beauty, adventure and authentic experiences are what we're after. Join us.